Because sometimes I post things fashionably late. Because sometimes I want to eat a whole pie in one bite (like I’m a giant). Because I’ve been messing things up lately. Because I made this filling twice. Because occasionally I’m a total custard amateur. So, sometimes pies work out even if you mess them up at first. 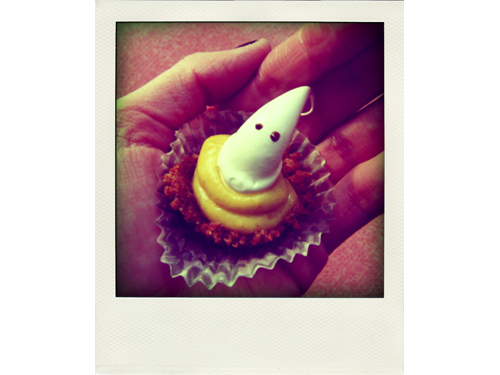 And they are extra good with a friendly mini ghost on top. What it comes down to is that these pies are really good. And they could even be your Thanksgiving dessert appetizer. You guys make at least 3 desserts for Thanksgiving like my family, right? *… or top with whipped cream! Bring the milk, vanilla, spices, 1/4 cup sugar, and a pinch of salt to a simmer. Don’t let it boil but let it get close to boiling. Meanwhile, whisk egg yolks with cornstarch, and remaining 1/4 cup of sugar. Gradually add your milk mixture into the yolk mixture, while stirring the whole time. 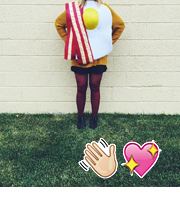 This tempers the yolks to keep them from scrambling and being weird. Pour liquid back into saucepan, whisk constantly over medium heat until thickens like pudding. Immediately remove from heat and stir in butter (melting it) and pumpkin. Strain filling through a fine mesh strainer into a clean bowl. Divide filling amongst all the cooled mini crusts. (I used my cookie scoop.) Chill pies in an airtight container for 4 hours. 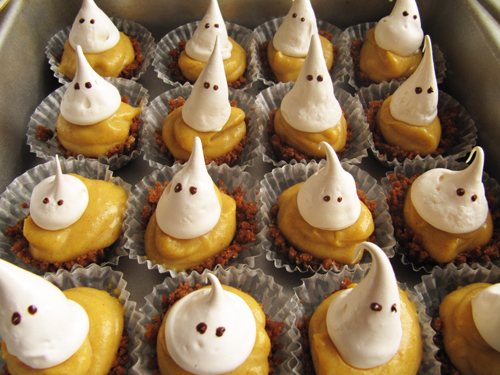 Top with meringue ghosts right before serving. These cookies are zesty-good. But if you’d like to make your own, my friend and fellow baker, Cindy, has a great recipe right here. 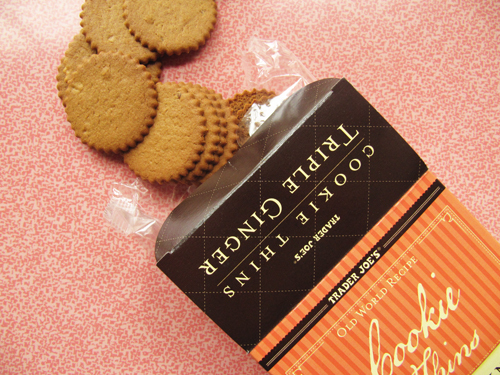 *A whole box of ginger cookie thins from Trader Joe’s. Preheat your oven to 350ºF. Mix together the crumbs, sugar, and butter until all of the crumbs are coated. Line about 50 mini muffin ups with paper liners. (Otherwise you won’t be able to get the crusts out.) Place a teaspoon of crumbs into each muffin paper. Press into the bottom using a shot glass. 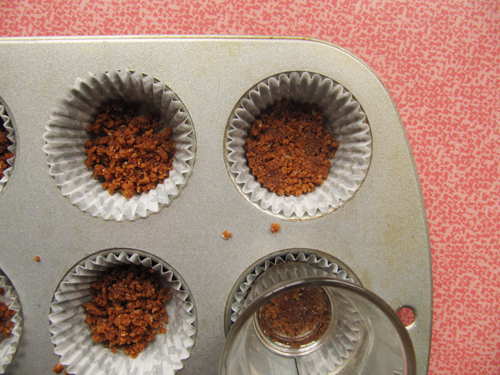 Add another teaspoon of crumbs to each cup and press against one side. Add another teaspoon and press against the other side, creating a cup. Continue until all mini crusts are formed. Bake for 5 minutes or until lightly golden and firmed up a bit. 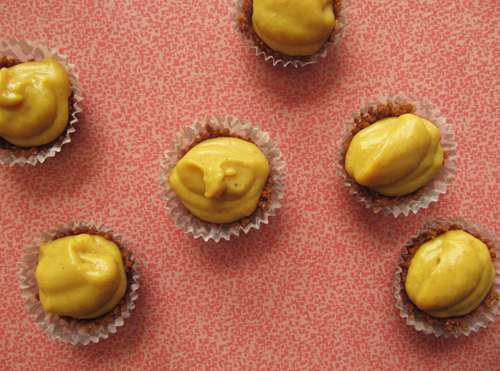 Set aside to cool, then fill with pumpkin filling! Ghosts are people too. And these little guys are mostly really cute. Make them various sizes! Some of them need to buy tall pants and some are petites. It’s just how it is. I love the tippy tops. Curly sues. Twirlz. Transfer bowl to a mixer fitted with the whisk attachment. Starting on low and gradually increasing to high speed, mix until the meringue is completely cool (test by touching the bottom of the bowl), and forms stiff, glossy (but not dry) peaks, about 10 minutes. Mix in the vanilla. Preheat the oven to 200ºF. Line rimmed baking sheets with parchment paper. Transfer meringue to a pastry bag fitted with a plane tip. 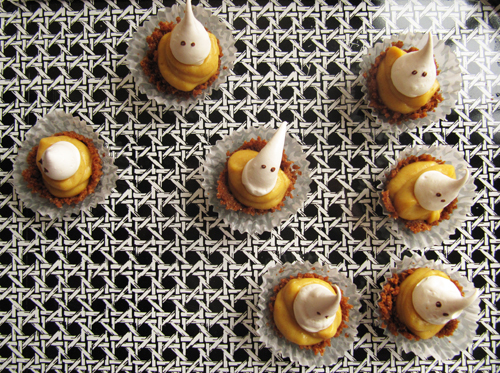 Pipe ghosts onto baking sheets, releasing pressure halfway and pulling up to form a peak. 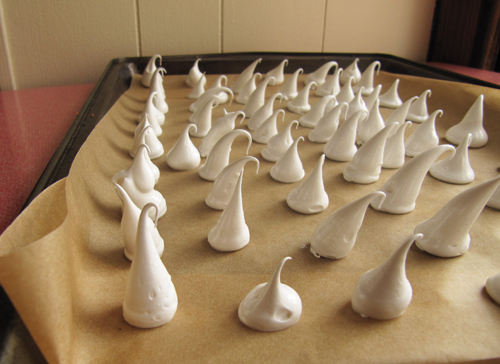 Bake the meringue shapes for 1 hour, rotating halfway through. Reduce oven temperature to 175ºF. Continue baking until meringue is completely dry to the touch but not taking on any color, 30-45 minutes longer. Dip a toothpick in melted chocolate and give each ghosts eyes. 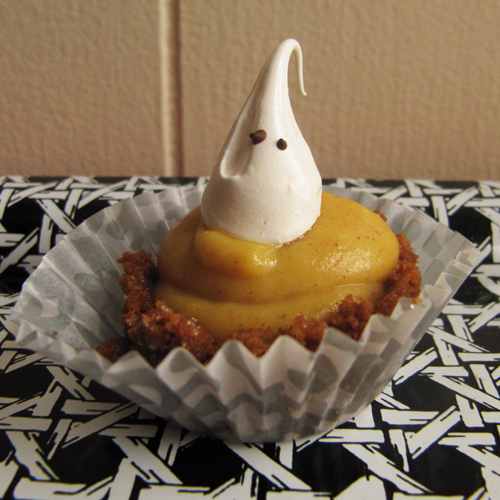 Don’t top your pies too much in advance or the ghosts soften and become marshmallowy. Don’t worry though, they totally keep their shape if chilled and softened. Yep. These were as tasty as they were cute. Is it weird that I liked them with their strange sparkly condensation? It sure did make them look fabulous! Pie babies! These are super cute and I love the idea of a dessert appetizer…no thanksgiving is complete with any less than two desserts! Yeah! Thanks, Cindy! 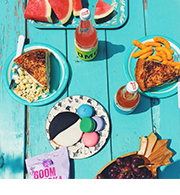 Dessert-etizers for all! 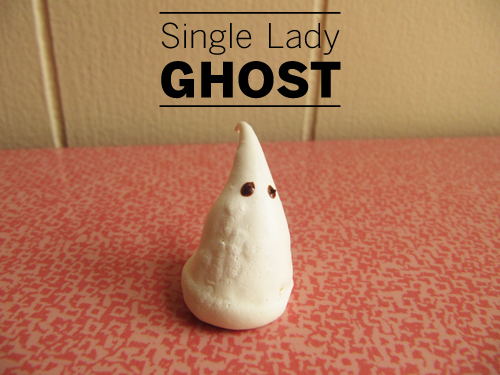 Awwww….the ghosts…I can’t stand their cuteness! I want to gather them all up and put them on my shelf and keep them forever. Yes! A teeny ghost family! These are quite possibly the cutest things I’ve ever seen. Ay caramba! Cuuuuute! I bet they are delicious too. Oh so cute! and bite-sized!